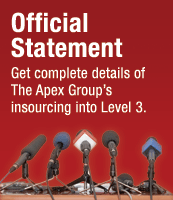 The Apex Group was created to develop and grow sales for ICT companies entering the emerging markets of EMEA. We selectively chose best-of-breed technology providers that could enable our regional customers' business objectives. In Level 3, we found a company that has a wide range of services delivered on one of the world's largest global communications networks. Our decision to join Level 3 was carefully calculated with our regional customers' best interests in mind — the combination of Level 3's network and our in-region market experience ensures a long-term commitment to supporting them. Level 3's company values of integrity and accountability match our own ethos; something we are proud to continue with Level 3. 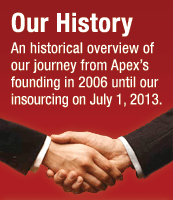 With humility, we recognize the support our customers and suppliers through the years and we thank them for helping us reach our apex. For our official media statement, click here. Web design provided by Ink Stain Design.